Hedge fund interest in CBS Corporation (NYSE:CBS) shares was flat at the end of last quarter. This is usually a negative indicator. The level and the change in hedge fund popularity aren’t the only variables you need to analyze to decipher hedge funds’ perspectives. A stock may witness a boost in popularity but it may still be less popular than similarly priced stocks. That’s why at the end of this article we will examine companies such as International Paper Company (NYSE:IP), Smith & Nephew plc (NYSE:SNN), and Check Point Software Technologies Ltd. (NASDAQ:CHKP) to gather more data points. Today there are a multitude of formulas stock traders have at their disposal to size up their stock investments. A couple of the most under-the-radar formulas are hedge fund and insider trading activity. Our experts have shown that, historically, those who follow the top picks of the elite hedge fund managers can trounce the broader indices by a solid amount (see the details here). We’re going to check out the latest hedge fund action surrounding CBS Corporation (NYSE:CBS). 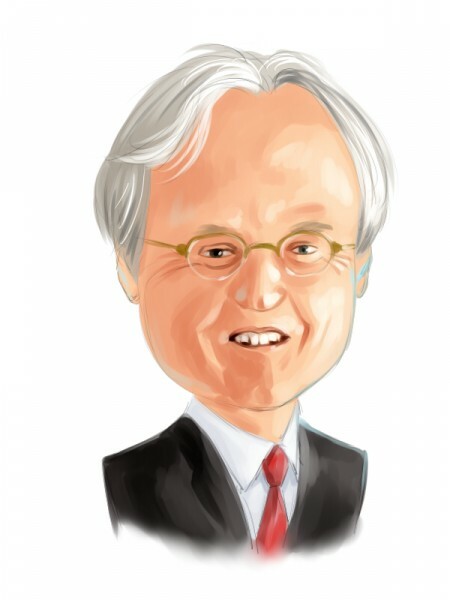 What does the smart money think about CBS Corporation (NYSE:CBS)? At the end of the fourth quarter, a total of 45 of the hedge funds tracked by Insider Monkey held long positions in this stock, a change of 0% from the second quarter of 2018. By comparison, 33 hedge funds held shares or bullish call options in CBS a year ago. With hedge funds’ capital changing hands, there exists a few notable hedge fund managers who were increasing their stakes considerably (or already accumulated large positions). Of the funds tracked by Insider Monkey, Larry Robbins’s Glenview Capital has the largest position in CBS Corporation (NYSE:CBS), worth close to $178.6 million, comprising 1.7% of its total 13F portfolio. Sitting at the No. 2 spot is Seth Klarman of Baupost Group, with a $111.4 million position; the fund has 1% of its 13F portfolio invested in the stock. Some other peers that hold long positions include Cliff Asness’s AQR Capital Management, Brett Barakett’s Tremblant Capital and Mario Gabelli’s GAMCO Investors. Since CBS Corporation (NYSE:CBS) has experienced a decline in interest from the smart money, logic holds that there is a sect of hedge funds that slashed their full holdings in the third quarter. Intriguingly, Howard Guberman’s Gruss Asset Management dumped the biggest stake of all the hedgies watched by Insider Monkey, comprising close to $144 million in stock. Lee Ainslie’s fund, Maverick Capital, also dropped its stock, about $133.5 million worth. These bearish behaviors are important to note, as total hedge fund interest stayed the same (this is a bearish signal in our experience). Let’s now review hedge fund activity in other stocks similar to CBS Corporation (NYSE:CBS). We will take a look at International Paper Company (NYSE:IP), Smith & Nephew plc (NYSE:SNN), Check Point Software Technologies Ltd. (NASDAQ:CHKP), and Global Payments Inc (NYSE:GPN). This group of stocks’ market values are closest to CBS’s market value. As you can see these stocks had an average of 24.5 hedge funds with bullish positions and the average amount invested in these stocks was $502 million. That figure was $903 million in CBS’s case. International Paper Company (NYSE:IP) is the most popular stock in this table. On the other hand Smith & Nephew plc (NYSE:SNN) is the least popular one with only 11 bullish hedge fund positions. Compared to these stocks CBS Corporation (NYSE:CBS) is more popular among hedge funds. Our calculations showed that top 15 most popular stocks among hedge funds returned 19.7% through March 15th and outperformed the S&P 500 ETF (SPY) by 6.6 percentage points. Unfortunately CBS wasn’t in this group. 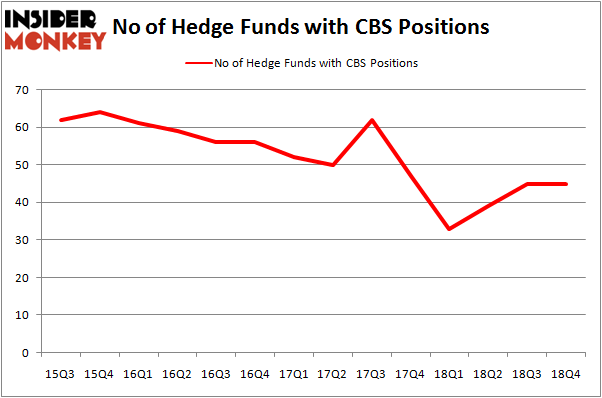 Hedge funds that bet on CBS were disappointed as the stock returned 9.5% and underperformed the market. If you are interested in investing in large cap stocks, you should check out the top 15 hedge fund stocks as 13 of these outperformed the market.